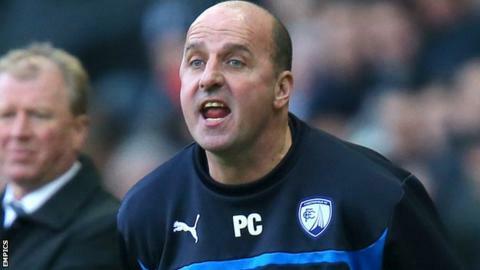 Chesterfield boss Paul Cook wants their focus to be on the pursuit of a play-off place rather than a rejected approach for him by Portsmouth. "It's about this club getting to the play-offs. "I've had the best two and half years of my life and long may it continue." Director of football Chris Turner described the timing of the approach as "disturbing", coming days before an important fixture in the club's bid for Championship football. Portsmouth, 16th in League Two, have been looking for a new boss since Andy Awford stepped down earlier this month with Gary Waddock put in temporary charge until the end of the season. And Cook is not surprised Pompey are approaching clubs. "It's not odd because Portsmouth haven't got a manager," Cook added. "If you're Portsmouth chief executive and board you want a manager. They're not going to worry about who they go after. "I'm manager of Chesterfield, we're in the play-offs, we're trying to get up and that's my only focus." Having led the club to promotion as champions of League Two last season, the Liverpool-born Cook accepts Chesterfield have been "victims of their own success" in receiving interest for staff and personnel. "It's the modern-day game, if you look at the success we've had as a club in the last two years, it starts off with selling players," he said. "Managers will always come under the spotlight of other teams, it's what happens when you're successful."